The Formby Times has reported that Merseyside Police have been cracking down on youths who steal mobile phones and bikes. Laura Jones of the Formby Times noted that since May 1 the operation has led to 44 arrests, 11 of those for robbery resulting in five people charged and six bailed. Police officers have made 462 stop searches and 91 stop checks, while also checking up on 568 “vulnerable premises”. During the operation 74 mobile phones have been checked against the Immobilise National Property Register which can help reunite victims of robbery with their phones. The operation has already seen a decrease in crime in the targeted areas. Along with more patrols and increased intelligence gathering the Police have been working with Secondary School pupils. With the summer holidays coming arriving soon I want to give out a very strong but clear message, that the Police are cracking down on crime and disorder throughout Sefton and if you or have the intention of committing crime you be caught, arrested and prosecuted. The Northamptionshire Evening Telegraph has reported that mobile phone theft rates have been steadily decreasing throughout the county thanks to forensic property marking schemes, encouraging people to use the security features on their phones and advising people to register their phones on www.immobilise.com. We’d urge people not to show off their mobile phones or leave them unattended in public places like pubs and restaurants. People are advised not to use them while walking in public places as you are more prone to robbery. We’d remind motorists not to leave phones in their cars and people should switch their phones to vibrate if they think their phone might bring them unwanted attention. 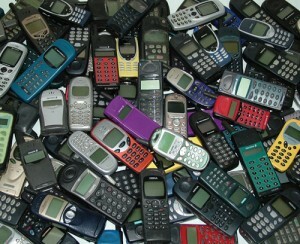 The number of mobile phone thefts in north Northamptonshire stood at 1,482 for the period 2006 to 2007. In the following year they dropped to 1,446 and the latest annual figure was 1,291. Greater Manchester Police have issued a warning to sat nav owners to help them avoid becoming the victim of crime. In many of these cases a satellite navigation system has been taken. Thieves are breaking into the cars to search the glove box and see whether any items of value have been left. Leaving sat nav cradles and sucker marks on display is the biggest giveaway that there is something of value in the vehicle. Our advice is simple, by removing any trace of the sat nav system such as the cradle and sucker marks from the window and by removing valuables or personal items from the vehicle you are less likely to become a victim of vehicle crime. Drivers should also park their vehicle in a locked garage where possible or leave it in a well-lit area as close to their home as possible. Using a steering lock and securing alloy wheels with locking nuts are also good deterrents. Other crime prevention tips include marking valuables with your postcode and vehicle registration number, and writing down the make, model and serial number of any items likely to tempt thieves. Drivers are also encouraged to register their valuable items on the Immobilise website (www.immobilise.com). To report crime call police on 0161 872 5050 or for more information visit www.gmp.police.uk. Cambridge News Online has reported that a Cambridge College is improving cycle security after a marked increase in bike thefts throughout the city. There was a 64 per cent increase in cycle thefts in March compared to the same month last year. Some 264 bikes were stolen in Cambridge and surrounding villages, up from 161 in March last year. That has prompted Cambridge Regional College (CRC) to take action against the thieves. The move follows a report in the News about police reviving a crackdown on cycle crime. We are fully committed to combating cycle crime and as such have only this week, as part of the new summer term, reminded students and staff that they can have their cycle coded by the security team at the college with a unique number provided in partnership with Cambridgeshire police and the Immobilise scheme. We have tagged around 150 cycles in the last term and have helped owners register them on the http://www.immobilise.com website. The scheme has helped to tackle the scourge of cycle theft. Since the introduction of the tagging scheme last September we have had only three reports of stolen cycles from the King’s Hedges site, which helps to prove that tagging cycles is, while not foolproof, a very good deterrent to cycle theft and greatly aids recovery and return to the rightful owners. Emma Stone of the Coventry Telegraph has reported that police in Coventry are targeting mobile phone stores in the city in a crackdown on the sale of stolen goods. Officers from Stoney Stanton Road police station, along with officers from Coventry City Council’s Trading Standards, have been carrying out spot checks at shops selling mobile phones and accessories. Four mobile phone stores have been visited in the last week and two were found offering illegal handset unblocking services. The stores were searched and seven stolen mobile phones were seized from the two city stores. In addition to the stolen phones, trading standards officers also seized a large quantity of counterfeit phone accessories from one of the shops visited. As part of the police operation, second-hand mobile phone stores are being asked to log details of the serial number, phone number and customer details of all handsets brought in for sale. will tell us if a phone has been stolen. Anyone wising to carry and use phones which have been stolen are now much more likely to be caught. Stores that do not check the validity of the phones they are selling will also be targeted by police and trading standards officers. He added that further spot checks were planned throughout the city. Hunts Post have reported that POLICE officers peeping into parked cars in St Neots has helped reduce crime, according to the latest figures. Officers look to see if any valuables have been left in the vehicle – such as satellite navigation systems and mobile phones – and then alert the owners. Eagle-eyed police community support officers have been peeping in vehicles in St Neots and Eynesbury – cutting the number of thefts by more than a half. Sector Inspector for St Neots, Mark Greenhalgh, told the Hunts Post, the Vehicle Alert Scheme has been extremely successful. He said there were 15 vehicle-related crimes in the St Neots area in March 2008 compared to seven in March this year. Vehicle crime in the town is down 25 per cent compared to last year. I put this decrease down to the vehicle alert scheme, which is about educating vehicle owners on how to avoid being a victim of crime. The scheme is about warning motorists that this time they were lucky because it was us who saw these items on show. But next time it could be someone else. Thieves are opportunists and it’s about not giving them the opportunity. The vehicle owners are sent a letter reminding them to remove all property and register any valuables at http://www.immobilise.com/ to help police identify it. Police are doing everything they can to prevent theft from vehicles but motorists must play their part by removing tempting items from display.